Russian pilot cosmonaut, 2006-on. Major, VVS and PVO 14th Army (Novosibirsk / SibVO) Cosmonaut 2006-10-11 to . Status: Active 2006-on. Born: 1974-08-19. Spaceflights: 1 . Total time in space: 173.14 days. Birth Place: Bugulma, Tatar ASSR. PERSONAL DATA: Born August 19, 1974 in Bugulma, Tatarstan, Russia. EDUCATION: Graduated from the Kacha Air Force Pilot School as pilot-engineer in 1996. AWARDS: Medals for distinguished military service of class 2 and 3, medal for military valour of class 2. 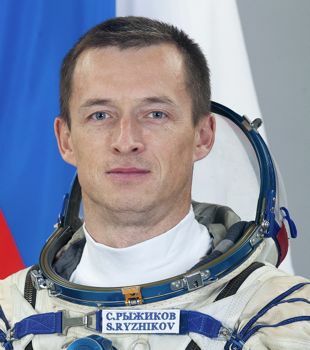 SPACEFLIGHT TRAINING: He was selected as a test-cosmonaut candidate of the Gagarin Cosmonaut Training Center Cosmonaut Office in October of 2006 (cosmonauts group 14). Ryzhikov finished basic space training in June 2009, and was qualified as test-cosmonaut. EXPERIENCE: From 1996 till 1997 he served as a pilot of the training air regiment in Saratov Region, in 1997 as a senior pilot of the fighter air regiment in Tver Region, from 1997 till 2007 as a pilot, senior pilot, chief of an air flight, chief executive officer of the fighter air regiment in Chita Region. Flew Л-39, Mig-29 aircraft. Major of the Air Force (ret), Class 2 military pilot. Family: Cosmonaut. Country: Russia. Flights: Soyuz MS-09. Agency: PVO. Bibliography: 5963. 1974 August 19 - . Birth of Sergei Nikolaevich Ryzhikov - . Nation: Russia. Related Persons: Ryzhikov. Russian pilot cosmonaut, 2006-on. Major, VVS and PVO 14th Army (Novosibirsk / SibVO) Cosmonaut 2006-10-11 to . 1 spaceflight, 173.1 days in space. Flew to orbit on Soyuz MS-02 (2016)..